The Sword of Rome series of novellas follow Julius Caesar and his centurion Lucius Oppius during their campaigns in Britain, Gaul and the Civil War. Sword of Rome: Alesia: Alesia, 52BC. Caesar’s army stands upon the brink of annihilation, caught between two enemy armies. Oppius is ordered to venture north of Alesia to capture Vercingetorix’s war chest of gold. He will be accompanied in his mission by one of Caesar’s agents, the beguiling Livia – the centurion’s former lover. As Caesar and Mark Antony face a battle for their lives outside the walls of Alesia, Oppius will have to fight against the odds to find and secure the gold. Yet will completing the mission this time exact too high a price? Sword of Rome: Pharsalus: Pharsalus, 48BC. The battle will decide the fate of a civil war and empire. Caesar’s forces are outnumbered, but he believes his veterans will not be outmatched. For one veteran, Lucius Oppius, the battle will be about revenge rather than glory. Oppius has vowed to avenge his father’s death. 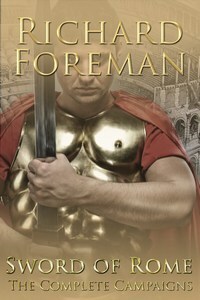 His enemy is Flavius Laco – a former gladiator and an agent of Pompey the Great. Against the backdrop of one of Ancient History’s most momentous battles two soldiers will wage their own personal war… Caesar, Pompey, Mark Antony, Brutus and Cicero all feature in the climax to the bestselling Sword of Rome series. For fans of Bernard Cornwell, Simon Scarrow and Conn Iggulden. Richard Foreman’s books have been widely praised. Richard Foreman is the author of numerous best-selling Kindle books, including ‘Augustus: Son of Rome’ and the Raffles series of historical crime novellas. He is also the author of ‘Warsaw’, a literary novel set during the end of the Second World War. He lives in London. Endeavour Press is the UK’s leading independent publisher of digital books.